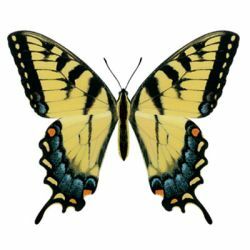 North American Butterfly Color Decals - Eastern Tiger Swallowtail - Full Color Eastern Tiger Swallowtail Butterfly Sticker printed on clear vinyl with light-fast inks and a protective UV coating. Size of each butterfly is 3.5 x 4.5 inches. Package includes 2 stickers. This series of North American Butterfly decals are exact in every detail. 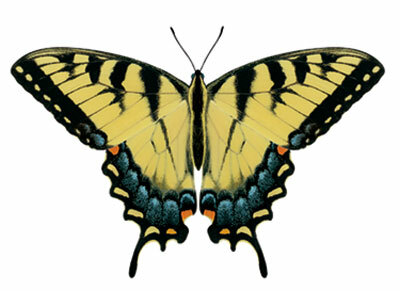 Anatomically correct size and detailed coloration of the Eastern Tiger Swallowtail�are stunning, truly museum quality reproductions.� Printed on clear vinyl and UV coated these, colors will last for more than 7 years on an outdoor surface, and will never fade indoors. The applications are as vast as your imagination, the only other place they can be found�are on the flowers in your back yard. Size of each butterfly is 3.5 x 4.5 inches. Package includes 2 stickers.